April | 2015 | Kerry On! 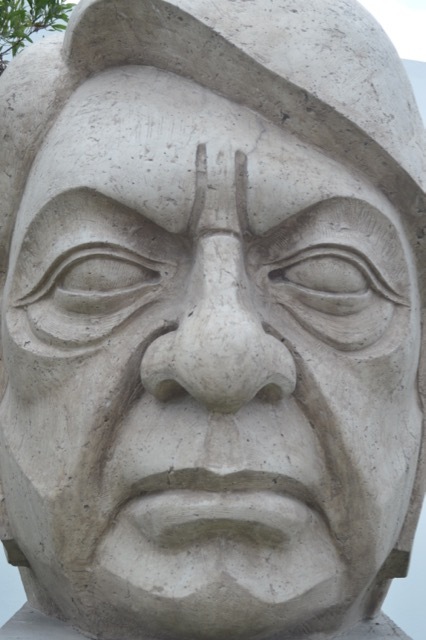 I admit that I had never heard of Oswaldo Guayasamin, Ecuador’s most famous painter, before we arrived in Quito. Born in poverty in 1919, Guayasamin devoted his artwork to portraying indigenous people, racial discrimination, injustice, violence and the plight of the poor. Powerful stuff. One of his famous quotes is “I cried because I had no shoes until I saw a child that had no feet.” The Fundacion Guayasamin site contains the artist’s former home and studio (he died in 1999) with its breathtaking mountain views, a museum called La Capilla del Hombre (Chapel of Man) that Guayasamin designed before his death and, as an added bonus, a small archeological site. It was amazing. An absolute must-see for anyone visiting Quito. The exterior of La Capilla del Hombre is bunker-esque, but inside the space is perfect, just as the artist envisioned. 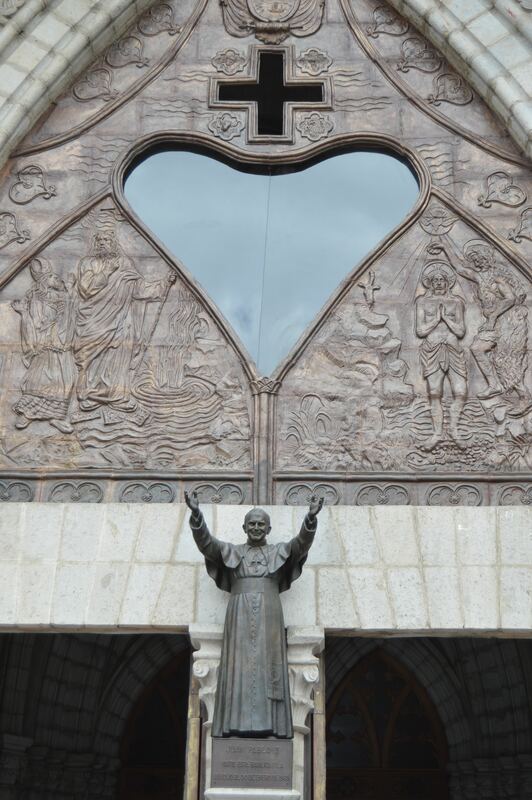 The Capilla del Hombre is a tribute to man, in particular the struggles and sufferings of Latin Americans. The museum has an eternal flame on the ground floor that represents a prayer for peace and human rights. Matt snuck some pictures. While it was definitely our favorite museum, we also enjoyed other museums and artwork around the city. The National Museum of Quito is housed in a complex that includes theaters and a few other museums and has some cool outdoor art. Pictures are forbidden in the museum (this time Matt complied) but the works ranged from pre-Colombian pottery and the like to religious art from the Colonial era. 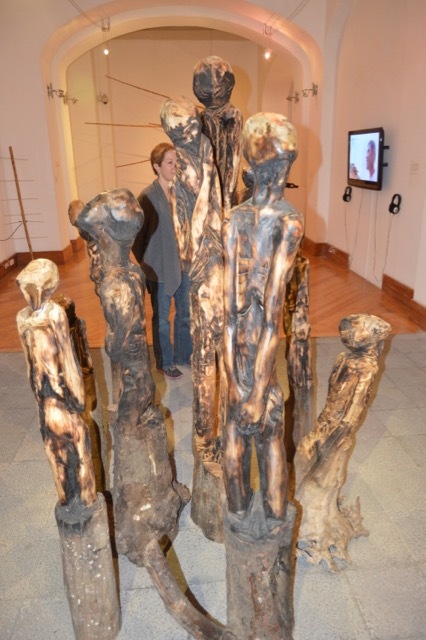 In the same complex is a modern art museum and we stopped in and enjoyed some work of Francisco Urquiza. I have no idea who he is but his paintings were really cool! Another museum visit, to the Casa De Alabado, was also well worth it although we again have no pictures to share. It had pre-Colombian artwork of the indigenous cultures. Finally, we enjoyed the Museum of Contemporary Art. Housed high on a hill overlooking the city in an old military hospital, the museum has rotating exhibits. 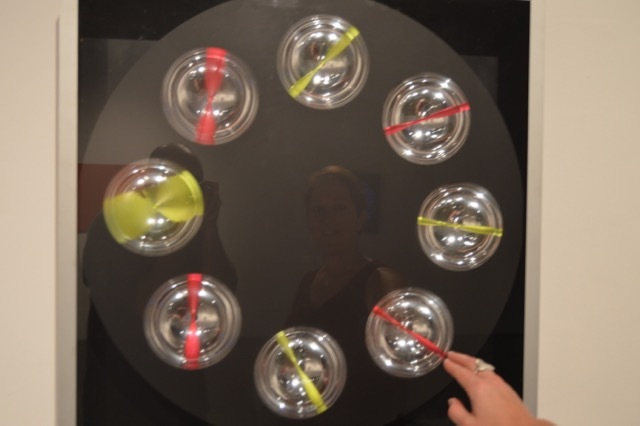 We saw three: a student photography exhibit, an Italian exhibit of art from the 1960s (psychedelic, baby!) and Art in Orbit, devoted to outer space. Art in Orbit included a room at the end, complete with bean bag chairs, where one could watch various sci-fi movies. I loved the room of gowns by Italian designer Fausto Sarli. Che Bello! The 60s art was dizzying with its play on dimensions. This piece was awesome and photographed pretty well. It was 2D but the pixie stick lines looked real! 2 Dimensional, but looks 3D! And last, but not least, if you can’t make art, join it! We have passed the 3 week mark in Quito, Ecuador. 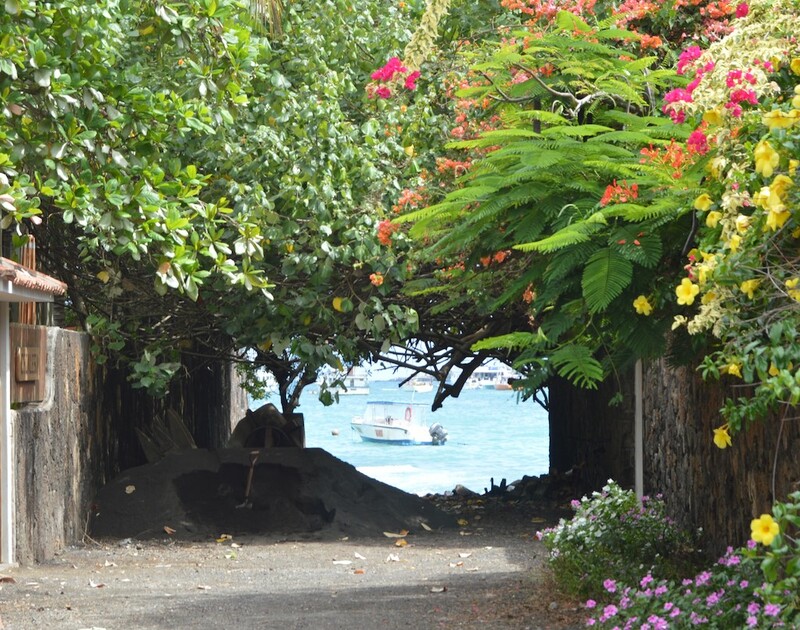 While this isn’t ideal and we would rather be getting on with our new life on the Galapagos Islands, there are worse places to spend a few weeks as you wait for your visas. Well, not just visas: we finally got those last week but now need the special permission to live on the Galápagos Islands. Nothing seems to be going easily, but we are trying to enjoy our time despite the frustration of waiting. Quito is situated in the Andes at 9,350 feet above sea level. That hasn’t posed a problem for us because we were used to living in the Andes in Cajamarca. 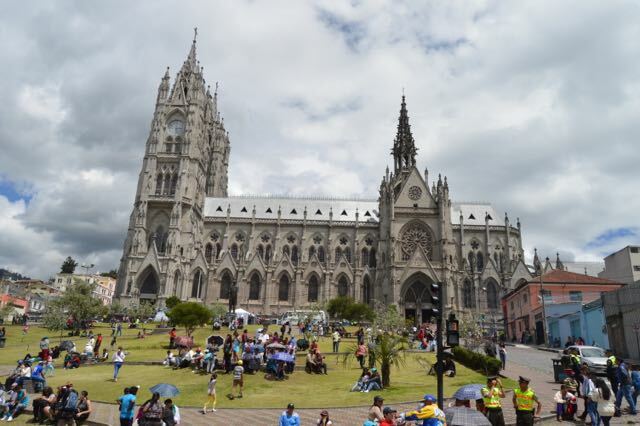 For a capital city with a population of about 2.6 million, Quito feels surprisingly accessible. 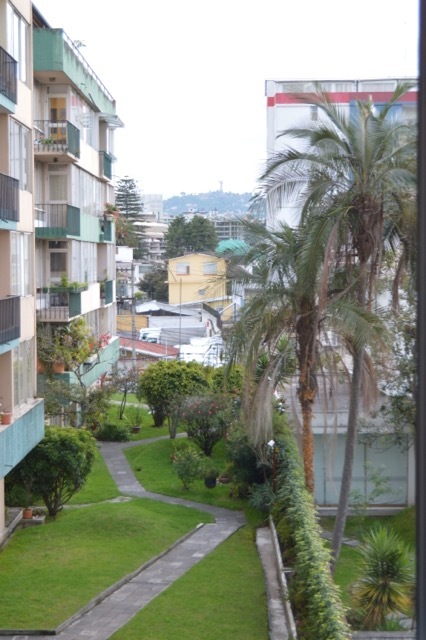 We are staying in an apartment (thank you, Airbnb) in the Mariscal Foch area, which is a great location for us. We can walk to a number of parks, restaurants, malls, the Old Center etc. 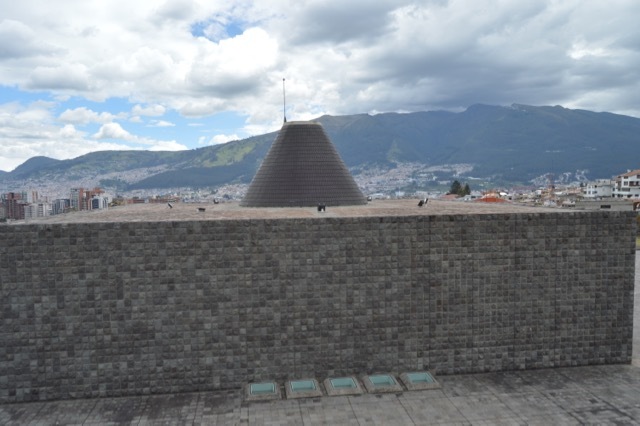 Initially Quito did not rock my world – it was nice but not spectacular. However, the more time we have been here, the more I appreciate it. (Except the food. Peruvian food is much better.) A mountain view anywhere you look is a selling point. One of my favorite things about Quito is the many parks. We have walked through Carolina, Ejido, Arbolito and Alameda parks several times. It’s a toss up which is my favorite. Ejido and Arbolito Parks appear to be one park and have a lot of trees (hence the name “Arbolito” or “Little Tree”), making for a nice walk. All of the parks are well used by families, couples, groups of people and, as we saw yesterday, card players. I didn’t get a picture, but it cracked me up – crowds of men around an overturned box, cash flying. Initially we thought it was a shell game but then we saw the cards. I’m not sure what game is being played or whether my assumption is correct that it is illegal, but I am intrigued. Park Carolina is a ginormous park. It has a running track, soccer fields, lagoon, old airplane, and, my favorite part, a wonderful botanical garden. I have dragged a somewhat reluctant Matt to botanical gardens everywhere we have visited and he agreed this one was the best. It might have been because the weather was perfect – low 70s and partly cloudy (key at the equator) – so it was pleasant to stroll around. There were many different exhibits and 2 greenhouses: one devoted to carnivorous plants and one to orchids. I wanted to see a bug get eaten in the Carnivorous greenhouse, but no such luck. The Orchid Greenhouse contains over 1,200 Ecuadorian species of orchids and is a highlight of the gardens. Our walks in the parks have been educational and relaxing. Not a bad way to pass the time. Next Up: Great Museums and The Middle of the World! “Are these people nuts?” It seems that I ask this question frequently in South America although not often in a church. I am looking at a rickety, unenclosed, 3 story ladder (unless you count the netting and I do not) that leads to the top of the one of bell towers of the magnificent Basilica de Voto Nacional in Quito. A stiff wind is blowing and as I watch, a septuagenarian makes the very wise decision to turn around and descend the ladder on her rear. There is a line of people waiting to ascend and the look of horror on my face makes it clear that I am not planning the climb. Another lady confesses that she made it three steps and had to turn back. I console myself with the fact that the view from the base of the bell tower is fantastic and causing an international incident by getting stuck on the ladder isn’t really necessary. While I am a wimp when it comes to climbing – actually descending – open staircases, this climb isn’t for the faint of heart. The Basilica sits high atop a hill in the city and the towers are 377 feet high. First Ladder and I Thought It Was the Only One! The funny part is that I didn’t feel that the rest of our climb around the Basilica was particularly safe. On the second story balconies we had to climb across crumbling corners and navigate electrical cords everywhere. Guardrails? Please. Apparently, your faith will protect you from harm! But touring the Basilica was well worth the risk – it is as spectacular as its views. It is patterned after Notre Dame and the Gothic design is fantastic. My favorite part was the native species gargoyles although the brilliant stained glass was a close second. The nave itself is unfinished and a bit cold feeling, but there is a small chapel, La Capilla de Sacramento, that is stunning in its decoration. Unfortunately, photos are not permitted in the Chapel. Pope John Paul II blessed the Basilica in 1985 and this welcoming entrance was one of my favorite parts of the building. I was having flashbacks to my Catholic school upbringing. I had stumbled into the courtyard of the Basilica del Voto Nacional on Good Friday and discovered a live enactment of the Stations of the Cross. It was odd – tourists were crowded about, taking pictures and videos, teenagers were cracking up over the fake whippings with ketchup used as blood, no one seemed to be relating the spectacle to the event. But as I watched longer, it seemed appropriate – a crucifixion was entertainment in its day, not unlike the horrific public stonings or executions in other countries in the present day. Or maybe that was just my excuse so we could take pictures too. 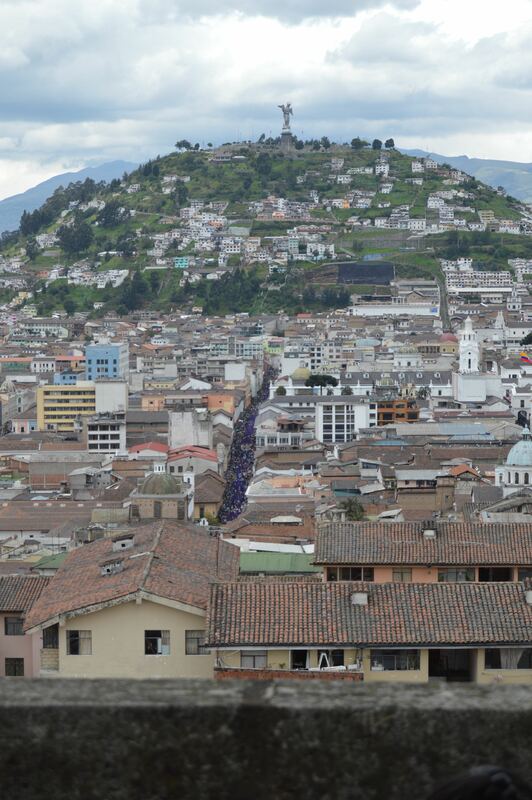 Welcome to Good Friday in Quito, Ecuador. A mix of sacred and carnival, Quito has a Good Friday Procession, Jesus del Gran Poder (Jesus of Great Power), that draws thousands for the 4 hour event. Many of the faithful dress in the purple robes and cucuruchos (cone hoods) of the penitent. Others dress as Jesus or Veronica, the woman believed to have wiped Jesus’s face, or Roman soldiers. Many carry crosses, some whip themselves with stinging nettles or have them wrapped around their bodies, the red welts apparent, and others have barbed wire wrapped around themselves, eating into their flesh. The parade also includes priests broadcasting sermons and prayers and marching bands. It is quite a spectacle. Many of the crosses are huge and carried by several people. They stagger a few yards with the cross before dropping it with a thud. Over halfway through the procession, we saw this father and son on a side street getting dressed to join the procession. Also notable were the number of children in the parade. Just what did they have to be so penitent about? This man also seemed to have suffered enough in his life. After the procession we enjoyed another Semana Santa (Holy Week) tradition: Fanesca. A special soup made only for Semana Santa it contains 12 grains and milk and is served with salted cod, boiled egg, fried plantains, slices of peppers, fried empanadas, fried empanada dough (masitas) and fresh cheese. The proprietors of the restaurant in which we ate were very friendly, eager to explain the special nature of the soup to us and concerned that we were happy with our meal. We were – it was delicious and filling. 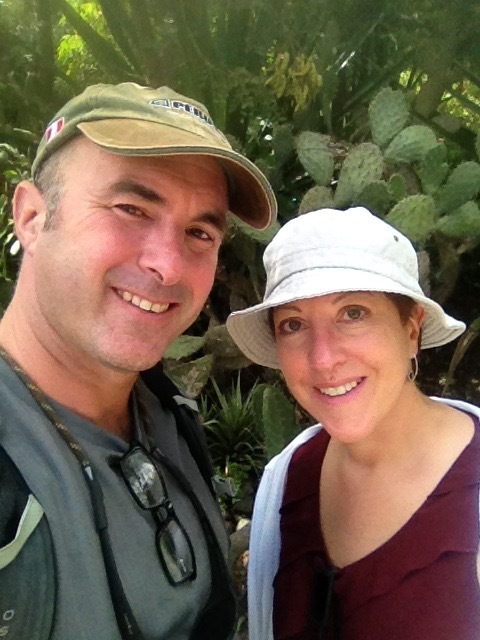 The Wait Is Over – Galapagos, Here We Come! I started writing this post before Matt secured his job as director of the Tomás de Berlanga school on Isla Santa Cruz in the Galapagos Islands, Ecuador. When I saw it in the archives it brought back all of the uncertainty we were feeling at the time, which continues in a reduced form to the present time as we hang out in Quito waiting for our visas to be processed, with our belongings somewhere in Lima, waiting to be shipped to us. The waiting is the hardest part. Okay, that probably isn’t true for Matt. For me, it’s the hardest part: wondering where we will be moving, where Matt will find a job. For Matt, the hard part is the endless interviewing, selling himself multiple times a week and sometimes multiple times a day. For our time at Davy School and in Peru is coming to an end. Unfortunately, within a few months of our arrival in Cajamarca in July 2013 the mine that funded that school announced it was cutting its support by 50% in 2014 and 2015 and then exiting the school business altogether by 2016. Matt’s expat salary, and those of the other expats, was an obvious place to cut costs. While the school would honor the contracts, the sooner we all left, the better. Matt’s contract is up July 2015, so this provided ample time to find a job. I realize that many, many people have been involuntarily without work, but it was a first for both Matt and me. I also realize that he has had several months of lead time to start looking for a job, which is a luxury most people don’t have. But we don’t have a home. We sold everything when we decided to embark on the this expat life. We live in Peru because Matt’s job is here, but as soon as his job ends, his work visa is revoked and we need to leave. Where will we go? So in August Matt began applying for jobs that were opening in January (Davy would be thrilled to release him from his contract) or July. Our geographical parameters were broad: South and Central America, most of Southeast Asia, Europe, Taiwan and Hong Kong. For political, safety and assorted reasons, the Middle East, Africa and Mainland China were off our list, as was Venezuela. And so the interviewing began. We didn’t keep track, but Matt made it to the “semi-finals” for several schools. It was exhausting for both of us. With every round of interviews we speculated endlessly. This one was the place, the location of our dreams. We would research weather, apartments, safety, etc. in an effort to convince ourselves that it was meant to be. Then, once we reached a comfort level and got enthusiastic over the possibility, Matt wouldn’t get the job. And on we would move to another part of the world. But then, it happened. In February Matt received a tentative offer for a school in the Galapagos Islands and an invitation for both of us to visit. So we went. Matt was instantly sold; I was not. I don’t know what I was expecting, but Puerto Ayora wasn’t it at first glance. It was, well, sort of Peruvian, but very expensive. Not the resort island I had expected. The next day I walked to this beach. And fell in love. The beaches aren’t the only highlight of the Galapagos. The Darwin Research Station is pretty amazing too. Unlike the Peruvian Dogs, I can outrun this guy! The highlight of our initial visit to The Station, as it is called, was the Giant Tortoise fight. One tortoise appeared to be the aggressor and would saunter over to the other tortoises, stick its head out and then sort of bite one of the others. The other one would sloowly back away and then the first one would lie down for awhile before starting over. It may not sound like a Tyson-Holyfield bout, but let me tell you, it was pretty darn entertaining! Another favorite spot was Las Grietas, which translates not very well as”The Cracks”, a deep chasm of volcanic rock with unbelievably blue, cool, fresh water. The trip requires a water taxi to “the other side” of the island and a nice walk to Las Grietas, but it is well worth it despite the crowds. Apparently there is a hole somewhere in the cliff and you can dive down into another pool. We plan to try it with our new snorkeling equipment.